Yes, I’m saying it.. 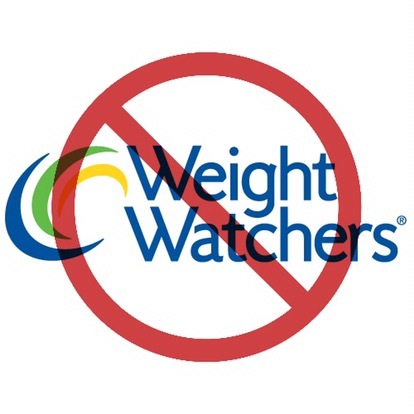 Weight Watchers is Bulls**** and it DOESN’T work. If you want too slow your metabolism down and make your body more prone to fat storage then by all means work away but have you ever thought to look at the bigger picture? If so many thousands of people have lost so much weight with Weight Watchers how come the whole world hasn’t done it and we’d all be a healthy weight and weight watchers wouldn’t be a business anymore… so how has it become a multi million pound successful business? People join > They loose weight > They’re happy > They think Weight Watchers is fab > They diet on their own > They stop loosing the weight because their metabolism is now dead > They put the weight they lost back on > They put more weight on > Blame themselves > Go back to weight watchers > Pay more money > start all over again. and whilst your going through this cycle over and over and damaging your body the big boss is sitting back watching the money roll in. According to Weight Watchers business plan from 2001 its members have “demonstrated a consistent pattern of repeat enrolment over a number of years.” signing up for an average of four separate program cycles. Yes in the short term you can loose a couple of pounds but in the long term your only going to gain this back and then some. The most common outcome of dieting itself is either weight regain or trivial weight loss – which leads to the repeat business of the company. So let’s look at a couple reasons why it doesn’t work.. Weight Watchers. So what weight are you actually watching? Yes, your own of course but so many factors can alter your weight, water retention, fat tissue, muscle tissue, hormones. One week you may drop 3lbs but is this fat? or is it just water weight? or have you just even been to the toilet? You can’t tell because its not accurate. How many times did you go to the toilet before you stepped on them scales? Reason #2 – It kills your metabolism…. In targeting fat loss vs weight loss, there’s a lot of careful factors to consider such as muscle maintenance, diet and the type of training to perform. Weight loss is pretty easy – just eat less and your body will eat muscle and fat thus giving you your weight loss. This is the Weight Watchers method. Again, remember the name, the clue is in the title ‘weight’ watchers. What then happens is that you lose a percentage of your lean muscle tissue and thus a percentage of your metabolism. Muscle amount is proportional to metabolism because it requires a lot more calories to keep muscle than fat. Weight Watchers is a company. Their goal is to not just make money, but make as much money as possible. They sell their own special foods and foster a kind of dependence on their system. When a client trains with me they are equipped to manage their body composition (not just weight) for the rest of their lives as long as they can remember the advice I give them. They are measured for body fat levels and lean tissue levels and given a diet and exercise regime that supports the reduction of the former and at least maintenance of the latter. The very nature of a ‘one size fits all’ system is set up primarily to make money and if the poor people who spend their money to step on the scales and see the numbers go down are happy then all the better for Weight Watchers. Did you know that from the above study 95.3% of their customer base are female? Does anyone find it strange that a non gender-based problem such as getting slimmer is so obviously aimed at one gender here? That’s a huge bias not far off 100% female attendees! I think this is because women are very ‘weight’ focused – for reasons we could go into but won’t – and Weight Watchers really plays on that vulnerability. We’ve been over the basis of the Weight Watchers method – mild starvation and ignorance. Now someone who is obese may well be better off after a year on their regime than if they’d carried on their previous path. We’ve lost muscle tissue. To lose muscle tissue is to lose, not just metabolism, but a certain degree of strength and support that our body needs. Especially in later life. I have to sell them the idea that their muscle tissue is likely under-developed and could do with a slight increase to raise metabolism and promote strength and also help avoid osteoporosis. Osteoporosis can come about through lack of bone density and bone density can be increased through load bearing (lifting weights). Muscle tissue is our best friend when it comes to metabolism, strength and bodily support (think back, abdomen, core stability and so on). To look after this key component we require a great deal of protein, a modest amount of quality carbs, quality fats and a decent weights regime. NOT a mild starvation diet. Invest your time and effort into hiring a Coach. Get educated in a positive eating lifestyle. This way you’ll be set for life any time you feel the need to get slimmer using a healthy approach. To burn fat requires eating more, not less. To eat less is asking for trouble. Of course, when I say ‘more’ I mean a solid diet of good foods. Trust me, if you’re on one of my diets, you won’t have time to feel hungry! Don’t pay money each week just to step on the scales on an empty bladder! If anyone has had any experience with Weight Watchers, i’d love to hear feedback or if anyone knows someone who could benefit from this read be sure to share. Prev Post: Why Isn’t My Low-Calorie & High-Exercise Diet Working? Next Post: What Does a Rubik’s Cube and Fat Loss Have In Common? It is a multi million dollar company taking advantage of the struggle of others. Totally agree with you – It’s getting the people that are struggling to see this!